Claudius Marcellus, my Lord and Husband, has graciously granted me permission to join him in Londinium, where a dispute over trading prices on our imported goods has delayed him. He has commanded me to request a safe resting place on my journey from Venta Belgarum. Reports from friends on your generous hospitality lead me to seek a safe resting place with you, avoiding the privations and perils at hostels along the road. I live in hope of your accession to my request and look forward to an exchange of news when we meet. If you are able to grant this favour Claudius Marcellus will be in your debt. 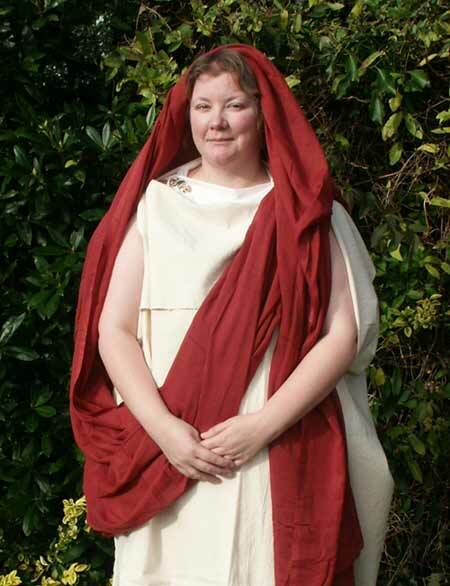 Dressed in a Roman-Britain high fashion, Flavia meets your pupils during a break on her journey and chats about her life. Reproduction artefacts that the children can handle enhance her stories. Children are encouraged to participate in role-play (slaves, servants and friends), which may include getting “dressed-up”. In addition to the character profile, period related craft workshops such as spinning and jewellery making are available. Although the character is imaginary, the events, places and details of her life are based upon Roman-British archaeological finds. Tricia can either remain in role during her presentation or step back into the 21st century and discuss the research behind the character. Audiences ranging from small groups to whole key stages can be accommodated. Aspects of Roman-Britain to do with health, hygiene, slavery, food, houses, family, entertainment, etiquette, travelling, communication. Living as a Roman in Southern Britannia. Roman names and what they mean. The changes in the settlements as they become more civilized. The Boudicca revolt – from a Roman citizens point view. If desired, Flavia (or her historian alter-ego) can run workshops with the children in conjunction with the teachers. Or teachers can opt to run these themselves whilst the characters work with another group/class. Workshop themes can include: Drop-Spinning, Jewellery, Weaving, Footwear, Food, Artefact Analysis, Pot Making and Clothes.